This site is dedicated to bringing together research from both sides of the Pacific about the Emishi people. The focus is on interpreting the research, and to remember the Emishi as a vital and important group whose people, though long gone, have changed the Japanese population, and whose influence on its history has been central. I was born in Sendai in the northeastern part of Honshu where the Emishi had lived. My imagination was captured as a young man when my mother and I took a train from Sendai out to Tagajou City to view the remains of the castle (1). As I walked around the site where the castle once stood there was a heavy summer rainstorm as I imagined the Emishi attacking the Japanese garrison stationed there many centuries ago. The Emishi were defending their land against the Japanese. I was struck by the mirror reverse image to the United States, because the people who were conquered by the Japanese, and whose culture was almost extinguished, the Emishi and Ezo of Honshu were people who resembled Caucasians. This was reverse of the American experience where descendants of an Asian group of Paleolithic hunters, the Native Americans, were systematically exploited and destroyed by Caucasian settlers from Europe. As we shall see in the following pages this is a superficial resemblance, yet, even 19th century Europeans were startled to find people who looked so different from the surrounding East Asian population in the far northern corner of Japan. Japan's population is not homogeneous now and was less so in the past. On March 11, 2011 a magnitude 9.0 earthquake occurred off the coast of the Tohoku, and the subsequent tsunami triggered by the earthquake was one of the most devastating natural disasters to hit Japan in some time. This is the same area where many Emishi had lived in the distant past. The only comparable event to this was another earthquake and tsunami that occurred almost in the exact same location in AD 869, over one-thousand, one-hundred and forty years ago when the Emishi were still living in the area. The earthquake known as the Jougan Earthquake (occurring during Emperor Jougan's reign) was followed by a tsunami that swept through the same areas as in 2011. The town surrounding Taga Castle that had developed during and after the Tohoku Wars was affected then as it was in 2011 with destruction and loss of life. In the battle near the town of Subuse (in Iwate prefecture) fought in AD 789, the main force of eight-hundred Emishi attacked the Japanese army of two-thousand soldiers that were making their way up the east side of the Kitakami river. They were pursuing another Emishi force that had earlier attacked them in the front and lead them into a trap. The main Emishi force proceeded to attack the Japanese army in the rear and east sides pinning them against the river. The earlier force who lead them into the trap were reinforced and attacked them in the front. They were surrounded. Panic turned to rout as they cast off their weapons and took off their armor in an attempt to escape across the Kitakami river. Most of the deaths were due to drowning. The Emishi army was made up of bands of horsemen who used bows to attack from a distance, and then used swords in close hand-to-hand combat (2). Conquest of Emishi: This website started out on the excellent site by Suzuta Yukinori, Conquest of Emishi. Suzuta Yukinori's site is indispensable for the detailed description of the military campaign the ancient Japanese state waged against the Emishi. Unfortunately, Yukinori's original site is no longer available, so I have created a mirror of his site here (updated 2019.1.5) pdf file. 1. Who Were the Emishi? My goal is to seek to place the Emishi in the broader framework of early Japanese history, and to show how they developed as a separate people before they were conquered by the Japanese state. Originally written for Suzutayu's site (above), Conquest of Emishi, it is a revision of Suzutayu's original. Revisions have been incorporated periodically (revised 2015.12.8; illustration revised 2016.5.2) pdf file. The connection between the Latest Jomon and Epi-Jomon cultures and the Emishi is an extremely important link that connects the historical period to the culture that came before (revised 2007.12.1) pdf file. 3. The Emishi, Kofun Culture and the Expansion of Yamato: The Kofun culture in the Tohoku is examined along with the Emishi people. Both agriculture and the development of centralized states took place in the Tohoku before the Yamato conquest of the Emishi (revised 2012.4.19) pdf file. 4. The Moving Frontier: From Emishi to Ezo: The clash between Yamato and the Northern cultures of Northeast Asia took place in Japan (revised 2013.3.16) pdf file. 5. The Treatment of Natives in the Nihon Shoki: the case of western Japan: Before the Tohoku Emishi were conquered there were the Jomon peoples of western Japan who were known collectively as Tsuchigumo. They were not just mistreated but were destroyed by the Japanese. If we can accept the accuracy of the records their treatment starkly differs from how the Emishi were treated (revised 2009.1.1) pdf file. 6. The early Yamato state and the eastern Emishi:The Japanese expansion into the Kanto and eastern Japan encountered numerous native tribes of Emishi who were gradually integrated as subjects of the Yamato empire. This process occurred in parallel with the expansion of Kofun culture into the region (2009.10.24) pdf file. 7. Evidence of Epi-Jomon Migration and Lifestyle: Evidence is mounting that the Epi-Jomon culture in Hokkaido and the Tohoku may point directly to the Emishi people (2007.11.30) pdf file. 8. Origins of the Jomon: Possible linkage between the ancient Jomon of Japan and the Australian Aborigines (edited 2009.9.13, illustration 2014.3.8.) pdf file. Though the numbers are small, an initial DNA study of the Tohoku confirms the Jomon nature of the original inhabitants (2013.12.20) pdf file. In comparison to the Tohoku southern Kyushu show some similarities but also unexplainable differences (2014.12.4) pdf file. 11. Population of the Sendai Plain: the Yamoto burials: New information from the Yamoto yoko-ana burial site gives a snapshot of the population of one area of the Sendai plain during the seventh through ninth centuries (2008.11.27) pdf file. A new comprehensive study of skeletal remains from the Kofun society of the Tohoku during the centuries of Emishi resistance in the frontier areas (2013.11.15) pdf file. An update on the Yamoto yoko-ana bogun. Is this the first confirmed evidence of the Emishi people? (2012.8.31) pdf file. 14. Ezo ana kofun and Emishi Society: The tombs of the Emishi known as ezo ana kofun tells us some important information about Emishi society (revised 2012.9.27) pdf file. 15. Hitakami and the Emishi Horse Archers: The central aspect of Emishi culture was the horse archer, and most scholars of Japan see this culture as both a challenge to the early Japanese state, and in influencing its transformation through the warrior culture. A major scholar of Tohoku history Takahashi Tomio looks at this culture and why it did not continue among the later Ainu (revised 2009.10.25) pdf file. 16. Emishi Fushu and Ifu: Here I will look at two differing perspectives regarding the Emishi allies, the fushu and ifu (revised 2013.1.19) pdf file. 17. Evidence of Emishi Arms, Armor and Clothing: An important aspect of Emishi culture that is not easy to verify (revised 2014.4.9) pdf file. 18. Northern Tohoku and Tsugaru Emishi after the Conquest: Post Conquest Emishi society and the dominance of asymmetrical trade (2016.1.5; edited 2018.12.6) pdf file. 19. Emishi become Ainu or Japanese in the Medieval period: Connecting the Emishi to the Ainu has often been mired by downplaying the power and success of the latter (revised 2015.12.17) pdf file. 20. The Emishi and Physical Anthropology: Latest findings suggest that much of eastern Japan was like northeast Japan in terms of its ethnic make-up in ancient times. This population was quite different from modern Japan (revised 2015.12.12) pdf file. 21. Emishi Culture and Identity: It is important to talk about the Emishi ethnic and cultural affiliation unlike what some Japanese scholars would assert. Cultural differences identified whether one belonged to the Japanese or Emishi, or the Japanese or Ainu later in history. Sometimes these boundaries were crossed over with unexpected results (revised 2010.10.14) pdf file. 22. Conclusion: Two perspectives on the Emishi and synthesis (revised 2015.12.3; title 2018.12.3) pdf file. Appendix A: Contemporary Illustrations of Emishi: Rare illustrations from some of the oldest sources (revised 2007.12.29). Appendix B: Kanji Terms and Interpretation (2007.3.15). Appendix C: Emishi language: a review of Emishi Aterui no tatakai (2011.9.2). Appendix D: Kennewick Man (2019.4.6). Field Museum of Natural History: Ainu Origins：This site is possibly the best for understanding this time period, and has excellent maps that I will link to in my pages where relevant. In particular it outlines the emergence of the Satsumon culture in Hokkaido, the northernmost island in Japan, about the same time that wars between the Yamato Japanese and the Emishi people were occurring in the Tohoku or northeastern Honshu, the main island of Japan. Islands of the Spirit: One of the best informational sites put out by PBS's Nova program that links the Ainu with the Jomon. Kennewick Man: An interview of James Chatters showing the possible links between the Jomon and Ancient America, particularly in regard to Kennewick Man (see Appendix for updated discussion on Kennewick Man). 1. I had the opportunity to go back to Taga Castle in March of 2014. See the appendix on the Conquest page for more details. 2. Sasama Yoshihiko. Nihon no Bugu Kachiu jiten. (Tokyo: Tsukasa sei-han, 1981). Drawings of ancient armor by the author on this website are for the most part modeled on this work, though any discrepancies of interpretation (as these are applied to the Emishi) are of course my own. The Emishi are depicted with riding boots widespread among continental and Nara (and Heian) cavalry of this time period with wide legged trousers. They probably also wore common footwear made of woven straw which would have been easier to maintain (Destruction of Castles in Michinoku, first illustration). The Illustration was revised (2016.4.26) to reflect current research on their armor, bows and horse equipment. The helmets of a couple Emishi were changed to reflect what they most likely wore during this late eighth century battle. Also small details such as stirrups and horse trappings are now more in line with evidence from kofun depictions and archaeological finds from likely Emishi tombs. I've also for the first time colorized the image and added background for context of this particular episode where the main Emishi army arrived from the Eastern mountain (higashiyama) (located to the right) and pinned the Japanese army against the Hitakami river (see detailed description). 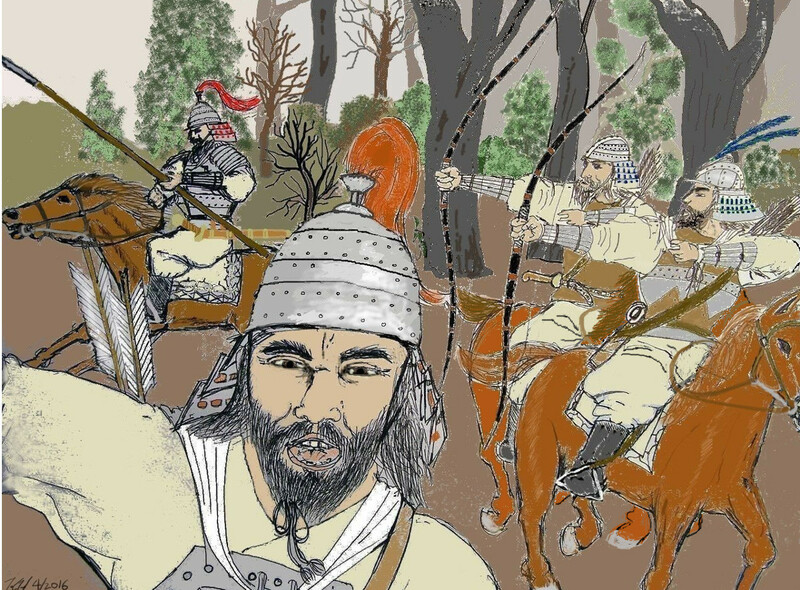 Compared to the Emishi horseman depicted on the Destruction of Castles, second illustration (see link above), these warriors had less of the newer armor because they had never been employed as fushu (allied Emishi) troops like Azamaro's men. About the Author and disclaimer: I worked on a Phd. program at the University of Chicago in Medieval Japanese history which I left unfinished. I have an MA in Japanese history from Northwestern University. This site is to mainly introduce English speaking readers to the work of Japanese scholars who have done research on the Emishi , and make no claims to original research. However, any errors of interpretation or facts are entirely my responsibility. Please cite any web pages used for reference. Any comments or suggestions are welcome and should be sent here. Latest revisions and additions: added illustration on Conquest of Emishi site (2018.11.30); 18. Northern Tohoku and Tsugaru Emishi edited (2018.12.6); From one reader's suggestion, I am now making links to pdf formatted pages to make it easier to print for the serious student or reader (2018.12.7); Appendix on Kennewick Man (2019.4.6). Please refresh the page to see the latest updates.